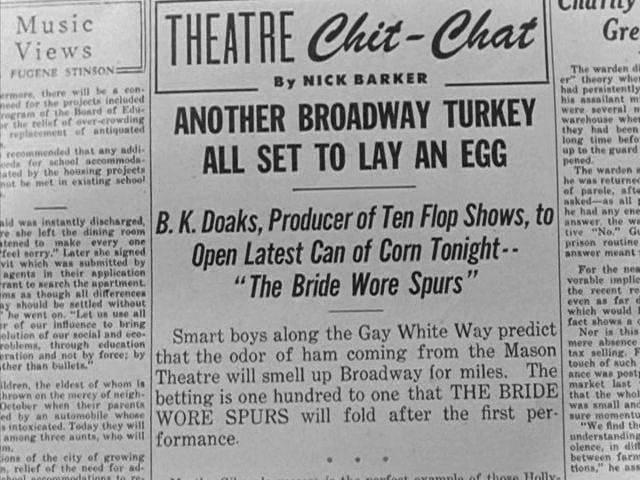 "Another Broadway turkey all set to lay an egg,"
"to open latest can of corn tonight"? P.S. This was obtained from the "Three Stooges" episode, "Three Hams on Rye." I am not sure of the meaning of the name of the episode, either. Turkey: Virtually all forms of entertainment use this [term] to indicate a bad or losing show. Its origin comes from actors (turkey actors) who opened poor shows on Thanksgiving Day in the hope of making money as part of the annual tradition. Possibly began in New England when a down-and-out producer found a nonroyalty play, some unemployed actors, a used set, and booked a date during turkey week, usually a period when healthy attendance might be expected. It is also said, however, that the phrase is attributed to the actor-writer-director Dion Boucicault, whose melodramas were the sensation of the 1890s. Boucicault once had a lousy show that opened on Thanksgiving and which he described as his turkey. The Boucicault story may be accurate, but if so it pushes the origin of the expression back to no later than the 1880s: Dion Boucicault died on September 18, 1890, at the age of 68.
turkey. The domesticated turkey hardly knows what to eat and has to be attracted to food by colorful marbles placed in its feed; it often catches cold by getting its feet wet and frequently panics and suffocates itself when the flock presses together in fear.For such reasons, turkey has been slang for any stupid, worthless, useless, unsuitable thing since before 1930. Turkey for a poor, third-rate play, movie, or book is said to be an invention of humorist S.J. Perelman, who in the 1920s called himself a "Pennsylvania farmer of prized turkeys, which he displays on Broadway once a year." Know what a "turkey show" is? The average citizen probably would think it some sort of poultry exhibition. But among theatrical people it doesn't mean that at all, acc[o]rding to W.H. Trueheart, manager of "The Hello Girls," who were at the Century theater last week. So by 1919, turkey in the show business sense of "a bum, no-account show"—whether on Broadway or off—was already established in entertainment industry terminology. can of corn/can o' corn n. An easily caught fly ball; a high fly ball that allows a defensive player time to stand under the ball and catch it easily. The phrase has long been assumed to have come from the old time grocery store where the grocer used a pole or a mechanical grabber to tip an item, such as a can of corn, off a high shelf and let it tumble into his hands or his apron, which was held out in front like a fire net. Dickson notes three other possible explanations, however: a longtime announcer (Bob Prince) who used the expression "It's as easy as taking corn out of a can"; the "kerplunk" sound that a baseball sometimes makes when popped up; a popped-corn-and-molasses confection called a cornball, sold and eaten at ballgames for many decades (no word on how the can part of "can of corn" figures into this explanation. Dickson reports that the person behind the third theory of "can of corn" noted above also"determined that the term was in use in the early to mid-1920s, based on a series of interviews in 1953 with semi-professional players." In my view, the "cornball" theorist's dating of "can of corn" would have more credibility if (1) he had provided a contemporaneous example of its use from the 1920s, and (2) his "cornball" theory weren't so dubious. Sudden disaster struck in the form of three lost games to Southern California, all by a one-run margin. In the first one Anderson got enmeshed in a pitchers' duel with Troy's ace, Jim Appleby. The game went to twelve innings, and to S. C., 3-2. It was Heringer's ill luck in the next clash; and it began to look like a jinx when the Indian outfield got stuck in reverse in the ninth inning and S. C. scored following a fly ball that should have been a "can o' corn." Six errors did not help Heringer, although Stanford collected twelve hits. Still, that instance from 1934 knocks a hole in the Bob Prince theory, since his broadcast career in major league baseball began in 1948. Corn: A largely derogatory term applied too almost anything in writing, directing, or performing that is trite, ridiculous, old-fashioned, or used in the hope that it will be a crowd pleaser. Most likely, the term derives from the use of such methods before less sophisticated rural audiences in the so-called "corn belt." A "can of corn" in entertainment lingo is thus a trite production, utterly lacking in freshness, that is calculated to appeal to a low-end audience possessed of neither taste nor sophistication. Meaning "inferior show, failure," is 1927 in show business slang, probably from the bird's reputation for stupidity. to lay an egg is a figurative expresssion to say that the show will be a flop. Can of corn is an idiomatic expresssion mutuated from the baseball slang which refers to something which is very easy, unchallenging. Not the answer you're looking for? Browse other questions tagged american-english slang . Where and when did the phrase “turkey of the year” originate? What is a “turkey walk”?